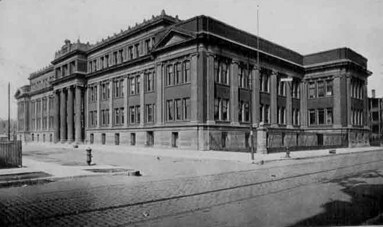 Lincoln Park High School began as North Division High School, which opened in 1875, as the first public high school on the north side of Chicago. By the late 1890s, the school needed more room, and construction began on the current school building in 1899. This building opened as Robert A. Waller High School in 1900. The students and staff of North Division relocated to the new building and the old name remained in use, alongside the new name, for several decades. By the 1910s, a concern grew that the school would soon need more room, and plans began to expand the school. It would not be until 1928 when land north of the school was obtained, and plans for an annex were pushed forward; plans that were interrupted with start of the Great Depression. The need for more space became critical, and the school's Franklin Branch was opened in 1934 (closing in 1948). In 1938, the school's annex was constructed to alleviate the need for portable classrooms. The new annex included (among others) two new gyms, which allowed for the original gymnasium to be converted into a lunch room for students. By the 1960s, the school's increased population required the return of portable classrooms as plans began for more expansion. The new north wing included a new lunch room and auditorium, allowing the old lunch room to become an office complex for counselors, and the library to move into the former assembly hall. The 1970s saw problems as the school aged and discipline issues caused the opening of an alternative satellite center for the school. As a part of the revitalization to the school in the late 1970s, the school's name was changed to its current name, and Orchard Street in front of the school was closed to create a mall between neighboring Oz Park and Armitage Street. The school is now serving over 2000 students and is one of the top ranked schools in the city as well as the nation. For a more in depth read on the History of the school please click the link below.